WARRANDYTE ABOUNDS with opportunities to enjoy natural landscapes and wild animals, birds and reptiles up close. Although sometimes people would prefer the reptiles to be a little more at arms length! The natural beauty of our lovely town and its environment is probably the reason a lot of people move to and live here, happily, for a very long time. It seems fairly obvious, but certainly researchers are in agreement that being connected to and exposed to natural environments has a very positive effect on our mental and physical health, for a whole variety of reasons. In fact, the research has shown that even just looking at pictures of nature on a regular basis can reduce stress and improve quality of life. People love being in and capturing their special experiences of nature, and then sharing those experiences with others. The Warrandyte Nature page is a vehicle for that purpose. It’s also a great way to find out about parts of Warrandyte you might never have know existed! Get on it. The Diary has limited space in the print edition, so for the web find attached a bumper gallery of the images we received for this month’s Nature column. If you like the selection of photos and would like to see more, please visit the Warrandyte Nature Groups Facebook page by clicking here. In the U13/3 Netball competition, the Serpell Jets were the clear favourites, coming into the finals with a win/lose record of 10–1, compared to the Warrandyte Bullants 6–5. However, the Bullants had been the victors in the Jets one and only loss of the season, giving the underdogs some needed confidence in the final. The Jets started the game like the favourites with a 3–1 first quarter, which was repeated in the second quarter only because the Bullants snuck a goal on the half time siren. It was looking bleak for Warrandyte Bullants at half time but by three quarter time they had the premiership within reach. 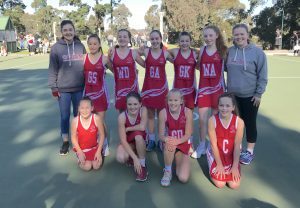 Aggressive defence by Scarlett Preston, a lot of hard work through the centre and around goal and accurate shooting from Amber Gedge saw the Bullants mount a solid third quarter comeback, entering the final quarter trailing 10–8. Both teams fought with everything they had in the final quarter, setting the large crowd on edge. The Bullants drew level with 90 seconds to go after a see-sawing nine minutes and with both teams playing so well, it was impossible to tell who would win. The Bullants hit the front with 30 seconds left in the game but the Jets still had a chance to level the scores as they took the ball to the centre restart. When the Bullants forced the turn over with only seconds left, their last goal proved to be the winner. As the siren sounded, there were cheers and tears for both sides with the Warrandyte Bullants winning 14–13. THE STONEHOUSE Gallery has taken up the mantel of hosting this year’s Melbourne Teapot Exhibition. Studio@Flinders started the annual event back in 2004, but when the gallery closed in 2016, the Stonehouse Gallery was delighted to be given the opportunity to extend the life of this annual event. 38 artists have contributed a combined total of 66 teapots (21 functional and 45 non-functional pieces). The exhibition features a number of prizes, of which a teapot from both functional and non-functional categories will be selected: excellence in design; highly commended; encouragement; people’s choice. Teapots have travelled from all over Australia to be in this year’s exhibition with the furthest all the way from Budderim, Queensland. Closer to home, entrants include students from Marge Beecham’s pottery group who work out of the old fire station behind the Mechanics’ Institute. But it is not only potters who have been hard at work in the build-up to this exhibition. As well as a large advertising poster supplied by Gardiner McGuiness, the gallery has also received sponsorship from Quinton’s Supa IGA Supermarket, Warrandyte Community Bank Branch of the Bendigo Bank and Rob Dolan wines. The gallery also wished to acknowledge Clayworks, GE and GE Kilns, Northcote pottery and Walker Ceramics for their donations towards prizes. Additionally, local businesses took part in the “Warrandyte Teapot Photo” social media campaign where they posted photos of their business using teapots in unique ways. Stonehouse artist and exhibition curator Marymae Trench has extended an invitation to all locals to come and see the wonderful teapots on display. “We are hoping that the Teapot Exhibition will bring many new people to Warrandyte, and that all local businesses (including the Stonehouse Gallery) will benefit from their visits. “We always appreciate the support from Warrandyte residents. “Come and visit us at the Stonehouse Gallery, 103 Yarra Street Warrandyte,” she said. The exhibition runs until August 15. An Urban Design Advisory Panel (UDAP) has been formed to represent the Warrandyte community with regards to the aesthetic elements of the works planned for the Warrandyte Bridge. VicRoads Acting Director of Operations Metro North West, Fatima Mohamed, told the Diary that any design changes will be guided by the outcome of the Panel meetings. “In addition to extensive community consultation already undertaken, an Urban Design Advisory Panel has been established to provide an opportunity for the wider Warrandyte community to provide feedback on bridge design, such as to the look and feel of the upgraded bridge and retaining wall and footpath finishes,” she said. • Outer bridge railing (design, colour, finish). • Bridge abutment treatment and finish. • Footpath surface colour and treatment. • Pedestrian movement — including possible under bridge crossing (with connections to the river trail). • Retaining wall treatments surface and finish. • Retaining wall pedestrian railings. • Landscape integration including replacement of the large Eucalypts which frame the southern bridge approach. • Rock beaching to drainage outlets and batters (local rock preferred). Panel members will be asked to provide advice and make decisions on the above topics on behalf of the wider Warrandyte community. At the bottom of this article is an image gallery with excerpts from the presentation given by VicRoads in the first meeting. The presentation gives details on bridge specs and the types of materials being proposed by VicRoads. David Carty, John Chapman, Theresa Dawson, Geoff Flicking, Kyle Gillan, Bambi Gordon, Leigh Hearn, Jennie Hill, Jeremy Loftus-Hills and Sasha Reid. The meetings are chaired by an independent facilitator responsible for guiding discussions to reach decisions for two to three topics at the end of each meeting. A report of the initial meeting was provided to the Diary by panel member Bambi Gordon. The meeting began with an overview of the first task for the Panel, which was to agree upon the objectives for the bridge works — and in fact the Panel itself. It was agreed that members would evaluate all options in the area of landscaping, environmental management, bridge finishes and so on against the stated objective to achieve “a functional bridge which is sympathetic to and reflects the environments and the character of the town in the design and finish”. Some changes had already been made (prior to the UDAP meeting) based on earlier objections received. The primary change to the plan was the addition of a shared footpath on the eastern side of the bridge. This then had a flow-on effect of requiring a pedestrian crossing on the northern side of the bridge to allow for people to access both footpaths from the north. The panel were against a pedestrian crossing on the northern end of the bridge due to the potential delay of traffic during peak hours. However, the panel was also concerned about having the pedestrian crossing on the southern end and it was generally agreed that this crossing needs to be under the bridge — whether that requires some steps down to ground level and back up to Yarra Street, or a slung pedestrian pathway under the bridge. Both options for a pedestrian crossing at the southern end will entail the potential removal of one or two trees — a further concern for some members as was the retention of the prunus trees that could be impacted by the addition of a left hand turn slip lane on Yarra Street. The panel ended the meeting with a number of questions for VicRoads and the bridge architect to consider. In general, the panel were respectful of each other and though no decisions were made on the night it is the Panel’s aim to come to those decisions over the further three scheduled meetings. Following the first meeting Kyle Gillan, who represents the WCA, told the Diary he was concerned with a comment from VicRoads engineer William Nottle. In his introductory comments to the panel Mr Nottle noted the project intends to double the amount of traffic through Warrandyte in the morning peak. “When [Mr Nottle was] pressed on the projected number of additional cars in Warrandyte he answered he could only comment on queue lengths and not increased traffic volumes. “The impact on the amenity and character of the town is of utmost importance to the WCA. The panel members returned to their respective groups to report on the proceedings, which initiated some heated discussion online. The second meeting of the UDAP was in stark contrast to the first. Prior to the meeting commencing, one of the members demanded 15 minutes to read a prepared statement to complain about a post made on Facebook a few days earlier by another member. A representative from the Historical Society also addressed this same post. At issue for both members was that a post on the Fix the Warrandyte Bridge Facebook Group referred to them as members of the WCA – which they are not. The post also commented that they had been against the bridge widening. Again they stressed that they are not against the bridge widening. With regard to the social media post the administrator of that group has since apologised for her assumption. It should also be noted, at no time did the post name any members of the UDAP. These and many of the UDAP members still have objections to various aspects of the plan and it is unclear how they will proceed if these objections are not addressed satisfactorily. Once the meeting commenced it very quickly went off the tracks with members wanting to make presentations and give submissions, which is outside the remit of UDAP. The various issues discussed at this second meeting, within the nine issues that UDAP is instructed to make recommendations upon were: landscape integration, pedestrian movement, pathway surfaces, beaching under bridge, retaining walls and new sections of bridge abutment. Regarding “landscape integration” and “surfaces” UDAP made recommendations, but in the most part the recommendations were for further investigation. For all the other issues UDAP has asked for further investigation. The meeting was very heated, with raised voices and direct criticism of the VicRoads representatives. At one point a member left (and was encouraged to re-join by one of the VicRoads Stakeholder Engagement staff). A few of the members have since said they hold little hope in UDAP being able to agree upon recommendations for the nine design issues, that the level of vitriol and disrespect makes the process very uncomfortable. These members also suspect there are some people who will continue to disagree simply to indefinitely delay the project. They are also concerned that one member of UDAP has already stated quite firmly that if the changes they want are not made the bridge widening will not proceed, while another has said they will “sit here for six months” if their changes are not made. Meanwhile, VicRoads has told the Diary the contractor has begun work in preparation to commence construction. “We have appointed a contractor which has begun off-site works which are not tied to the planning process and we intend to commence on-site activities in the coming months,” Ms Mohamed said. This is despite The Diary being led to believe that one member of UDAP is considering taking the matter to VCAT, which could delay the commencement of works until at least next year. As we go to print, three members of the advisory panel are considering whether to continue with their role. LOCAL producers have impressed at the 2017 Australian Food Awards, bringing home a total of six prizes from the prestigious competition. Competition debutants PoppySmack were awarded two Bronze medals for their Vietnamese Dipping Sauce and Siam Chilli Sambal, while North Warrandyte’s Blue Pear Pantry took home a Silver medal for their Gourmet Sausage Rolls. Ringwood-based Asterisk Kitchen continued their fine form from last year’s competition, winning both the Gold and Best in Class medals for their Fennel and Thyme Lavosh Crackers, as well as a Bronze medal for their Activated Coconut Charcoal Lavosh Crackers. Conducted by the Royal Agricultural Society of Victoria, the Australian Food Awards are the country’s leading national food awards program. The Awards recognise Australian products and produce across eight categories in which the judges focus on the sensory and technical aspects of the product and its appearance. The gold, silver and bronze medallists are awarded with a national brand seal of quality and the opportunity to be showcased at international and local trade shows. The presentation dinner will take place on September 7 in the MasterChef kitchen and it promises to be an appetising night, with award-winning products usually featured at the ceremony’s dinner. “It will be a fun night – lots of people from the industry, big or small; good food — usually made by a very well known chef,” said Younis Khazour of Asterisk Kitchen. Deb Graham from Blue Pear Pantry is looking forward to the presentation night, yet still can’t quite believe that she has won an award in just her first entry into the competition. Ms Graham believes the secret to Blue Pear Pantry’s success is largely due to high quality ingredients. “My local suppliers give me fresh produce,” she said. This prestigious award is sure to give business a boost, with the silver stamp not going unnoticed by potential buyers. “People’s eyes look at them differently than they have in the past,” she said. For Hanh Truong of PoppySmack, it is not just about producing great food; it is also about sharing the Vietnamese culture throughout the community. “I just feel like there are a lot of stories that we can share when we’re at the market,” Ms Truong said. “It’s always come down to where we’ve come from and what we can bring to all our customers. The talents of these local producers affect the lives of people in ways much deeper than just their taste buds. Ms Truong, along with her sister and business partner Tran also use their skills with sauce to raise money for the Welcome To Eltham group – an organisation which strives to make refugees feel safe in the local community. “We create enough money in the business that we can donate it out and help others,” she said.